Permanent Magnet Market size will surpass USD 50 billion by 2024 gaining the industry by CAGR over 10%. Growing wind energy demand as a dependable renewable energy source, influenced by depleting fossil fuel reserve, is likely to drive the global permanent magnet market. Annual wind mill installation crossed 60 GW in 2015 across the world, increasing from close to 35 GW in 2013 and is set to cross 75 GW by 2019 according to the Global Wind Energy Council (GWEC). Increasing wind energy demand in Asia Pacific region, led by China, will have a positive impact on the overall permanent magnets market. China recorded wind energy installation capacity at over 30 GW in 2015 which was more than 40% of the global share. The United States had close to 13% share of the global annual installation capacity in 2015. Climatic negotiations at UNFCCC’s COP 21 moved forward for a 100% emission free power generation by 2050. This will propel the demand for light weight and strong permanent magnet market in the upcoming years. The product finds extensive applications in the automobile sector for their attraction and repulsion properties, energy conversion properties, as well as for the application of magnetic field to shape, control, and direct electron and ion beams in the electronic systems. Global passenger cars and commercial vehicles production increased from approximately 87.5 million in 2013 to beyond 90.5 million in 2015. With increasing disposable income and development of economies in several countries, the global automobile production statistics are likely to witness a steady growth, thus propelling the automotive permanent magnet market share. Advancements in product manufacturing technologies, with low cost methods such as hydrogen decrepitation and powder method, will also catalyze the global permanent magnets market in the next few years. Development of rare earth metals such as neodymium, samarium, and dysprosium for their superior physical properties has led to application in small sized products such as electronic gadgets. Large R&D investments implemented for the development of new and high performance magnetic materials will also boost the global permanent magnet market. High and fluctuating prices of raw materials could affect the industry. Also, the rare-earth metals concentration in the Asia Pacific, mainly in China, has led to increased prices of the raw materials in North America and Europe. Hazards associated with rare earth metal mining may also pose a threat. Permanent magnet market has been classified, based on the materials used for their production, into ferrite, neodymium alloy (NdFeB), samarium–cobalt alloy (SmCo), and aluminum–nickel–cobalt alloy (AlNiCo). Neodymium alloy based products, also called as neo magnets, was commercialized in 1984 after being developed by Sumitomo and General Motors in 1982. It is a significant product segment with close to two-third of the global share. This segment contributed more than USD 14 billion for the overall permanent magnet market size in 2015 and will grow at a CAGR beyond 10% up to 2024. Ferrite based products will lose share to neodymium products owing to lower adhesive force per unit of weight and low aesthetic quality. However, they have an extensive application base in conventional products due to lower price and easier availability of raw materials. This segment generated over USD 5 billion in 2015 and will have a healthy growth up to 2024. 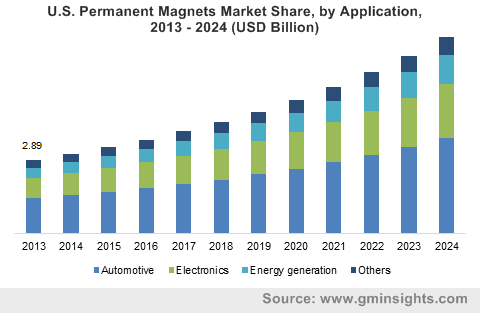 In terms of application, global permanent magnet market size has been segmented into automotive, electronics, energy generation, and other applications. Automotive segment had a notable share due to a wide range of application. The product may be used as energy conversion device that finds extensive application in motors used for accessories, sensors, actuators, meters, speakers, alternators, etc. Permanent magnet market size for automotive applications was more than USD 10 billion in 2015 and with rising cars and commercial vehicles demand, it is estimated to have a remarkable growth in the upcoming years. Energy generation is likely to be a major application driven by a mushrooming wind energy demand in the power sector. This segment is estimated to grow at over 10% CAGR to reach a revenue of USD 6.5 billion by the end of the forecast period. Asia Pacific, primarily driven by China, accounted for over USD 10 billion in the global permanent magnet market in 2015. This is on the account of growing production capacities of automobiles, electronic products as well as wind energy. As of 2015, China had a cumulative installed capacity of wind mills of over 145 GW, which was roughly a third of the world total. Possession of around 25 GW of total installed capacity of wind mills and over 4 million passenger cars and commercial vehicle production in India will also support the overall permanent magnet market in the next eight years. Automotive production in China garnered over a 25% of the world production capacity in 2015. North America recorded around USD 4 billion in 2015 and will gain by over 9% CAGR. The growth will likely be on the account of the U.S. passenger cars and commercial vehicle production crossing 12 million in 2015. U.S. also recorded a cumulative wind energy installation capacity close to 75 GW by 2015 and is expected to grow substantially in the upcoming years. With China controlling the majority of rare earth metal mines, global permanent magnet market has a number of manufacturers from this region. The market is extremely competitive with companies banking on mergers, acquisitions and investments in R&D to capture the maximum share. One of the leading manufacturers, Hitachi Metals Ltd. invested in an innovative production line for NdFeB and ferrite magnets in October 2016 in order to increase production capacity. Permanent magnet market is fragmented owing to the presence of several small and medium scale companies. Key industry participants include Hitachi Metals, Adams Magnetic Products, Arnold Magnetic Technologies, TDK Corporation, Electron Energy Corporation, Hangzhou Permanent Magnet Group, Anhui Earth-Panda Advance Magnetic Material, and Molycorp Magnequench. Global permanent magnet market is expected to have strong growth potential throughout the forecast period owing to the developments in its application sector. Growing demand for light weight and strong products will propel the demand for NdFeB based products which are also aesthetically superior to conventional ferrite products. Ferrites find varied applications in low power, high temperature, low budget, and/or external usage products. Energy conversion applications to generate electricity will have a great influence on the industry. With depleting fossil fuel reserve, wind energy has become a significant renewable energy source and will continue to gain the industry at a notable rate.